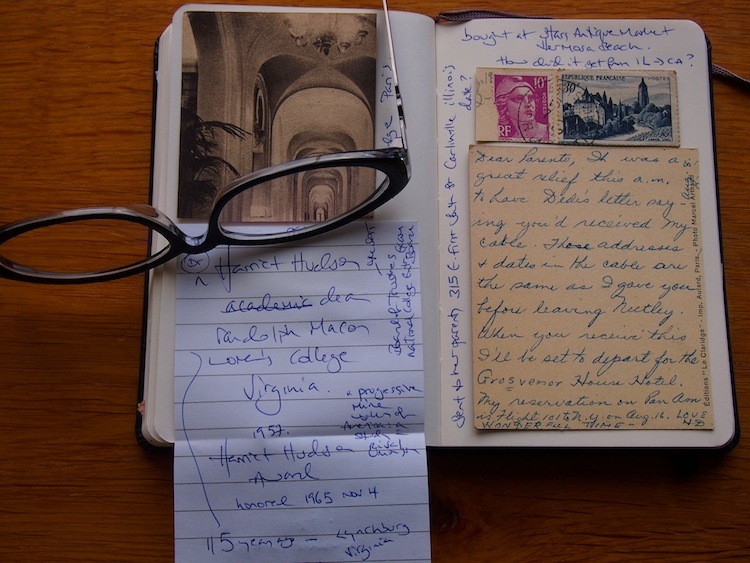 postcards from the past, from Paris. 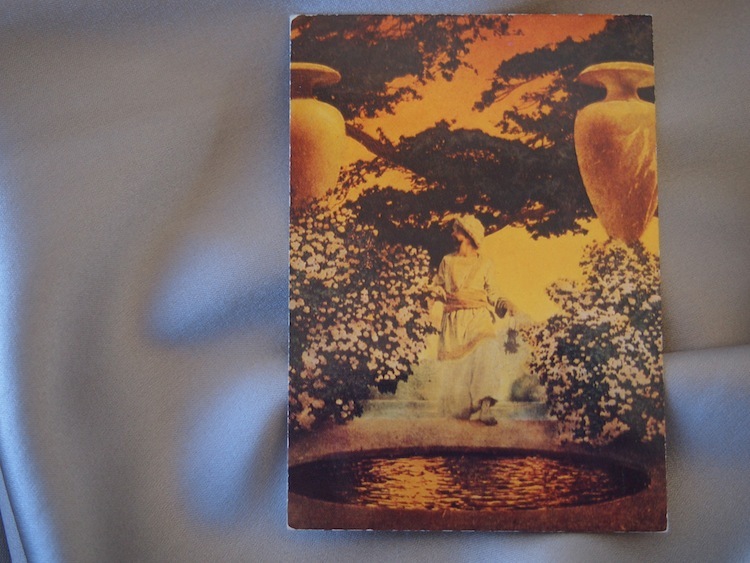 – teamgloria, inc.
postcards from the past, from Paris. Posted on February 6, 2014 February 12, 2014 by teamgloria in people., places., things. as you may recall – we adore Post. sending it, receiving it, admiring it, writing it. for example – last night, as we walked home from the grocery store after spending the evening with friends, we popped into the smallish cubby hole (yes, the one by the Laundry Room by the mid-70s mirrored glass lobby which is not that photogenic or we Would have shared it already) and Picked up the Post. Mr. William Godwin is a most special Friend. perhaps a cross-cultural confusion has arisen. on the left – Mr. Ronnie Corbett from a comedy duo called The Two Ronnies (yes, there was a second Ronnie, a much taller one – for comedic effect), a stalwart of innuendo-chortle-inducing saturday night “Telly” (as the Brits call it) while the Nation sat agog from the many brown-ish shades of sofas popular that decade (often with a fringe for the more middle-class aspirationals). That would be Danny La Rue. a stunning entertainer and all round genius. Next time you see William, he can tell you the story of how he MET the great one. It’s a good tale and no mistake. Plenty of sequins (not on William, he does a nice dark suit, slim-cut, polished shoes). back to the Post (about) Post. so we got a postcard from Paris – from the Past – this week. 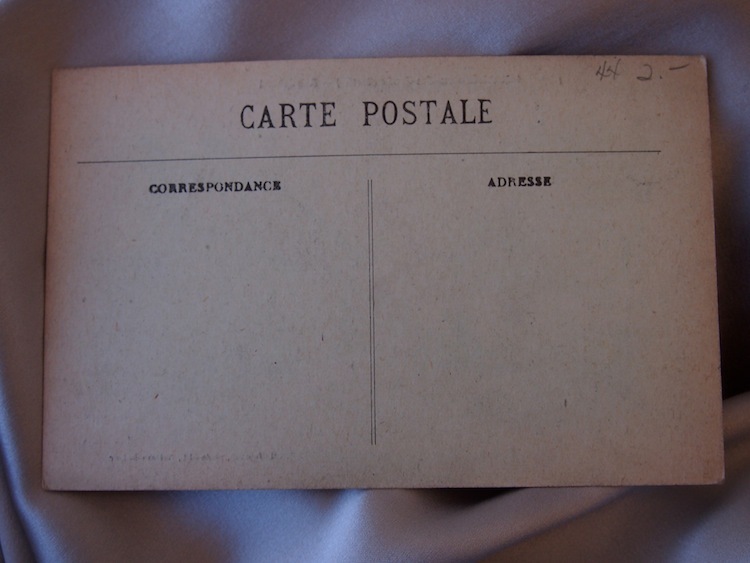 you see, we Adore a Carte Postale. and most especially when there’s still the message, quite discernible, on the back. we pick it up and start to read, with a great deal of Wonder. 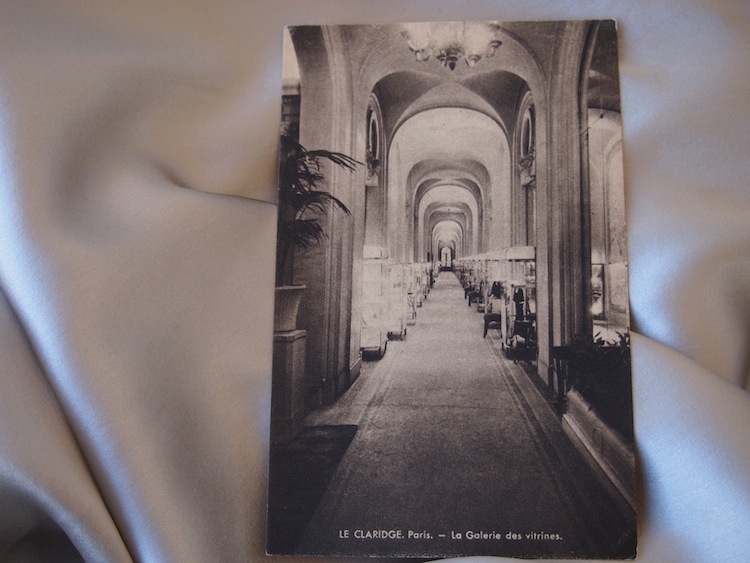 she – for it was indeed a she – was in PARIS at Le Claridge (or just stopped in to buy this postcard, perhaps she was staying with bohemian 1920s (?) friends in the Quartier Latin) and heading to the Grosvenor House Hotel in London before making her way back to the United States on Pan Am Flight 101 (which just happened to be the flight that the Beatles took in 1964 on their 1st trip to the USA for the so-called “Beatles Invasion” although we do Not believe that was their intention, they just came to play some music and very nice music it is too). back to our friend HD, still suspended in the early 20th Century (when exactly do you think? post College Trip?) – we became Fascinated at this young American woman, flying on Pan Am, sending Cables (don’t you wish we still could?) and her European sojourn in such fine places. so we did some sleuthing (because that’s what we do). and here’s what we found! who became the Dean of Randolph Macon Women’s College in Virginia and was obviously so Respected and beloved that there’s a Scholarship Fund in her hono(u)r to this day. In 1965, The Pittsburgh Press, gave notice that Dr. Harriet Hudson would be celebrated at a tea for her great Achievements in Academic Life. so – working backwards – someone would reach such a venerable age to be so Feted at Retirement age or thereafter – so let’s say that our (for we feel she is now part of teamgloria) Dr. Harriet Hudson was circa 65 in 1965.
thus born at the beginning of the 20th century. if the Postcard from PARIS was sent post College on a last hurrah before settling into her Career (for we find no record of marriage so we assume she was a Career Lady – like us – which is delicious and probably had a wardrobe of sensible tweed skirts and a Good pearl necklace and interesting hats for sundays) then on Friday, in San Juan Capistrano, we held a Postcard from PARIS 1920s. 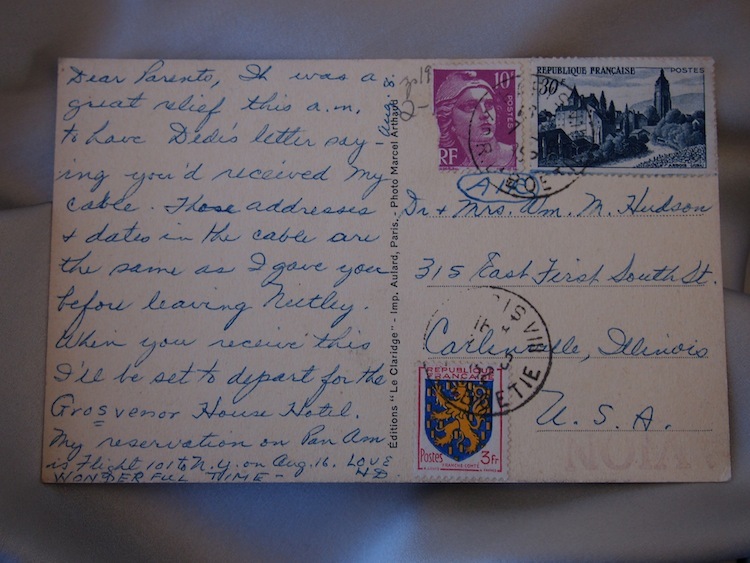 the m y s t e r y we will never solve is how Harriet’s postcard from the 1920s got from her parent’s house in the City of Carlinville (where her father was the head of the College there) all the way to california Ninety Years Later. but we *think* (always a dangerous activity yet such fun) we have solved it. Dr. Harriet Hudson wanted to send teamgloria a postcard from the past from Paris. and we’re Thrilled she did. let’s face it, if you’re going to send anyone a postcard from the past from paris – at least you know WE are going to get it and treasure it (in moleskine #161 if you’re reading this in the Future and looking through our Archives in the Library). 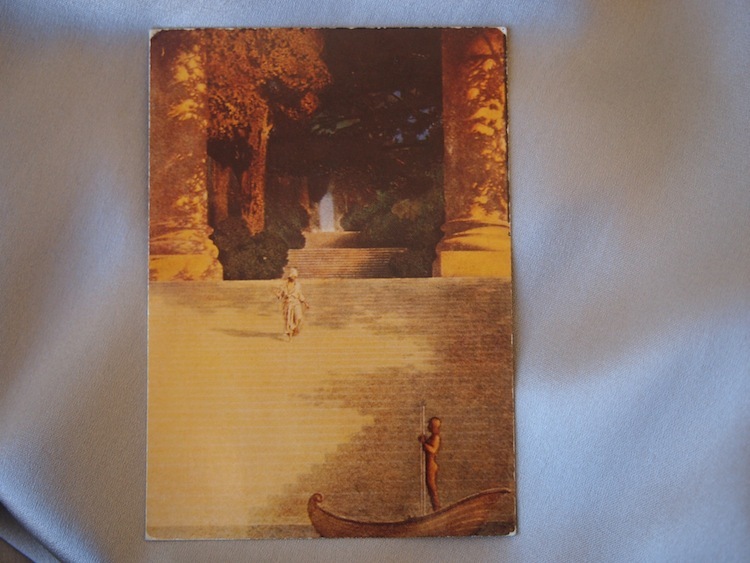 some lovely Maxfield Parrish cards. 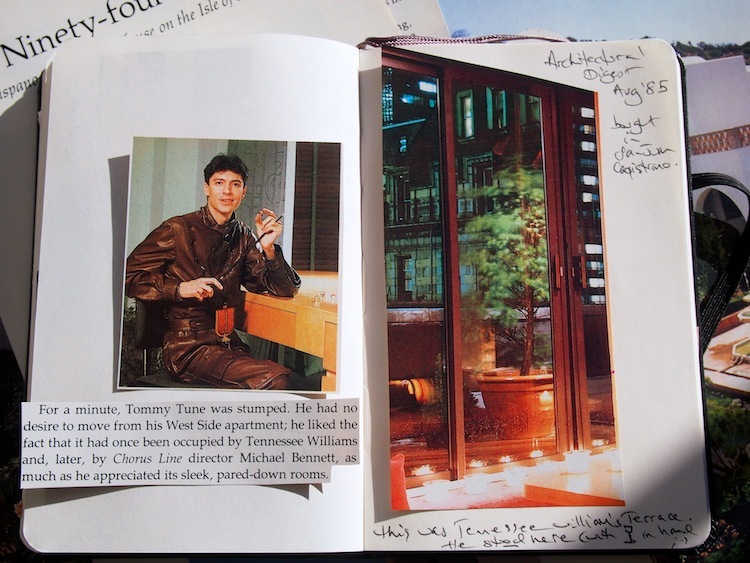 due to some Further sleuthing we found that our clipping from Architectural Digest August 1985, contained the apartment of Tommy Tune which was once the dwelling of a certain Mr. Tennessee Williams (145 W.55th Street from 1965 – 1966) and Mulligans is still here (although the Mulligans themselves have long retired – we did call and ask if we could visit) – where the lovely bear-like Mr. Rob Reiner used to go to stay sane in a crazy world. 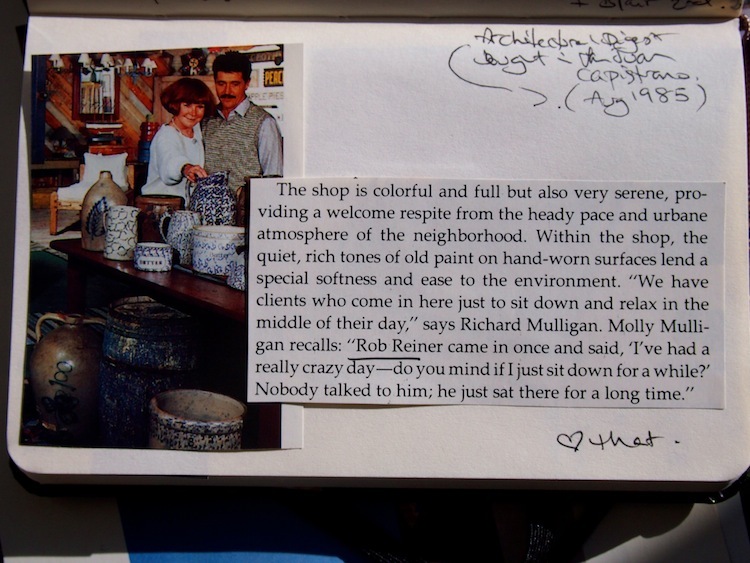 we Are going to visit Mulligans (the shop, not the people) today. AFTER we drive to the virtual bungalow on the Studio Lot of Miss. Vickie Lester to be helpful around some digital matters (well, we’ll be sitting on the chaise by the window admiring her plantings – who-we-are-in-RL is doing the helpful/digital bit). 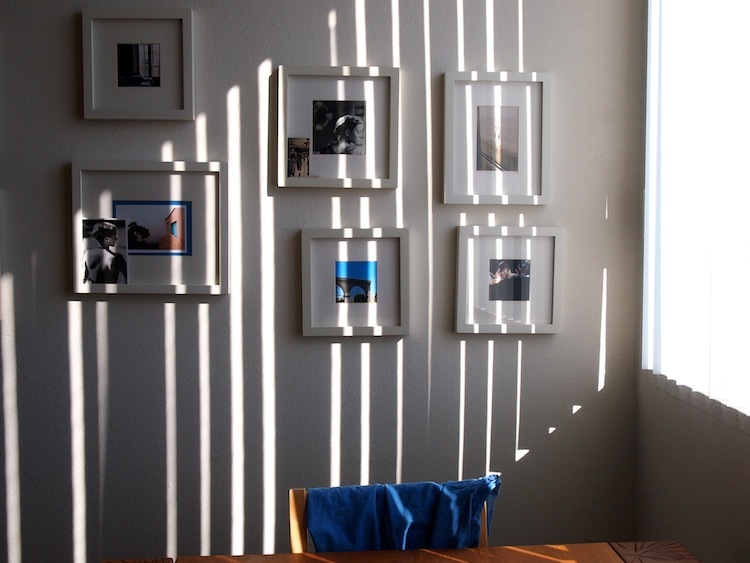 it’s very sunny over here so the blinds are drawn. 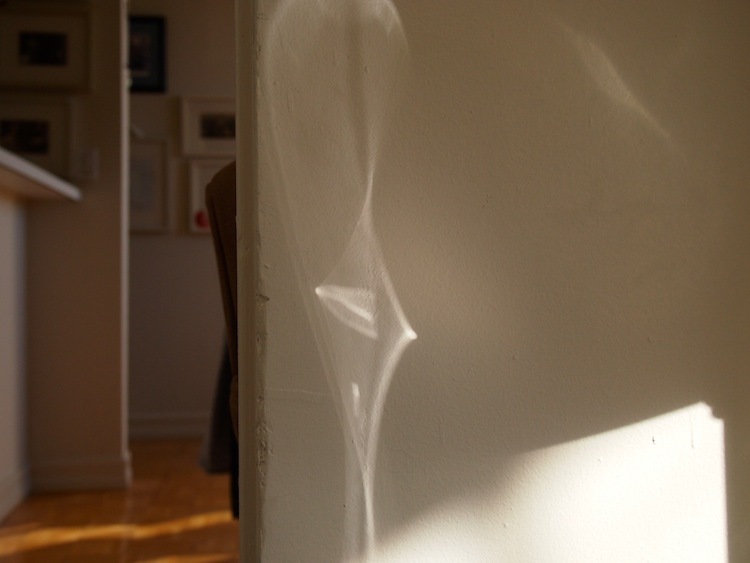 and light beams play on the creamy walls. or is that Dr. Harriet Hudson smiling because we got her Postcard from the Past in Paris? you n e v e r know. because the bit that Really made us *gasps* was not (just) Paris or its probably vintage but the fact that our new friend Harriet was flying from London to NYC on August 16th*. *and is also, of course you know this already, Ms. Madonna Louise Ciccone’s birthday. Previous Post gosh. guess who is in good housekeeping tomorrow? This is the kind of story that is to me like a post card from the past. I love the way you look at things. Things that most people would say are ordinary you see and hear the extraodinary. You are connected to the songs of the spheres. But then that is after all what is playing always on that old Victrola in the next room …. Isn’t Vickie’s bungalow on the Studio Lot lovely? Did she tell you about the singing sisters and the magical fireplace? P.S. 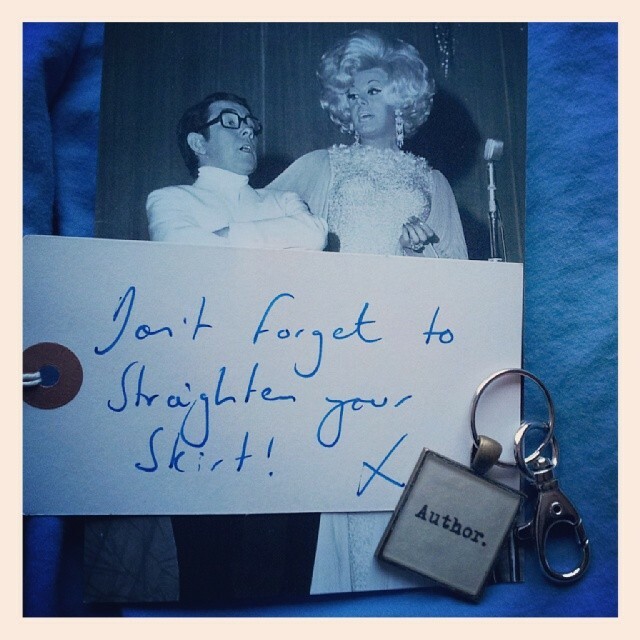 Danny La Rue is all about magic! we have indeed heard the Tale. Lots of shivers; goosebumps……and of course 50 years today since that now famous Beatles’ invasion. And you are such a sleuth! sometimes we scare people with our Powers of Deduction but it is wonderful to reach back into the Past and find stories, non? Oh yes! I had a wee shivers experience, this week. Have been considering a project. NZ Society of Authors says first step is Find a Manuscript Assessor. Googled. Looked at a list of Assessors; behold! one lives in my neighbourhood and is a published author and Benedictine oblate. Perfect, I think. Deep breath. I phone. Lovely conversation. She comes to my home the next day. We discuss. She leaves. A few hours later, I am listening to the radio..and what is the story of the week but her book; Travel Book of the Year. I had no idea the story was on radio. Was this random choice of mine, random at all? Mmmmm……shivers. in our (quite vast now) experience, life is not random but a Maze of deliciousness. now we’re Very Excited to hear there’s a Manuscript that an Assessor might get to Assess. make someone else do the washing up. Love! Valor! Exquisite Little Black Dresses! I have this wonderful book from a muse in RL at my elbow. Bed beckons and the most delicious read is on order of, “How to Stay Sane in a Crazy World”. Lovely ephemera. Lovely word to denote lovely things. I collect postcards of Lovely Ladies and just purchased an especially lovely pinched-waist-curvy one whose devoted owner decorated her dress with watercolor and glitter. It’s easily over 100 years old, yet she lives forever. This was indeed a source of wonder and thank you for sharing your journey to its source! they DO live forever if we continue to admire them – glitter dresses and all. How wonderful. I like Dr Harriet very very much. But mostly I love the idea of being celebrated with a Tea. How proper! Thank you for the sweet words, you are very welcome and very lovely. I’m glad the Royal Mail did its thing and provided you with a spot of cubby hole delight. If any of your readers want a real treat, I suggest you tubing ‘Danny La Rue London Palladium’ and marvelling at the frocks. Danny was Britain’s highest paid entertainer in the early to mid 1970’s and it shows in the frocks. Danny La Rue At The Palace is actually the clip to search for. had to go out earlier to do some Work and All That.